For a modern and eye-catching sofa with a unique flair, the silver skyline sofa made from shiny metallic vinyl is the absolute pinnacle of such fascinating furniture pieces. Classical exquisiteness merges with contemporary brashness to provide a sofa that both excites and soothes with its unique texture and shape. If you’re looking to make a statement in an interior, this silver skyline sofa is definitely the furniture item for you. The sofa is comfortable as well as attractive. Polished chrome legs provide a solid base whilst the stitching detail and buttoned back finish off the aesthetic charm of the furniture piece. For best results, the silver skyline sofa is best positioned in a modern living room, bedroom or games room where it will be able to compliment existing décor, perhaps of an eclectic nature. Regardless of the positioning, the sofa will proudly shine and this can be accentuated by using decorative accent pieces whether lighting or fabrics. Combine colorful accent pillows and throws with the silver sofa or place contemporary table or floor lamps nearby to bring out the shine and colors even more. The design possibilities which such a piece are endless and exciting. 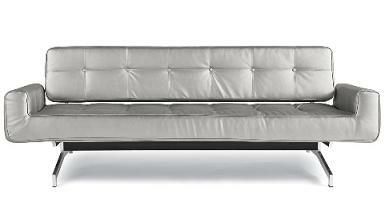 You can purchase this sofa from here: Silver Skyline Sofa. The following snippets of advice regard the points to consider when purchasing a comfortable sofa for your home interior. It’s important to consider all of these tips when buying a new sofa in order to find the best one that will suit both your physical needs and the aesthetic quality of the room in which it is to be situated. Comfort is of course the key requirement. The length of the sofa is an important factor to consider. Most of us like to lay down on a comfortable sofa, at some point, to watch the TV or take an afternoon snooze. It should thereby be long enough to accommodate the tallest person in the family who is likely to make use of the new furniture piece. This detail can often be overlooked, meaning that the full scope of benefits a comfortable sofa offers can be lost when the wrong size is purchased. Comfort is in the eye of the beholder, or rather, in the amount of back pain or muscle damage a person might have. People like different comfort levels and this is especially true of people who have back problems or are elderly. Sinking deeply into a big cushioned sofa will not be particularly comfortable for the aforementioned people. Therefore something firmer will be required. When buying a sofa, consider who will be using it most and then work from there. Sofas can be found in a wide range of comfort levels and there is literally something for everyone. Another factor to consider what will improve comfort levels is the back of the sofa. As with the prior point regarding cushions and comfort, different people will like different heights. Once more, consider who will be using the furniture piece the most, their height when seated and any medical conditions they might have which would require a taller sofa back than normal. As well as this, take into account the look of the interior and how a larger back and its design would compliment the existing décor. The materials used on the making of furniture play a large part in the comfort levels one receives from being seated on your new sofa. Whilst the look and texture of the sofa will largely be dependent on aesthetic and décor factors, there is also the way the material interacts with the body to consider as well. Some materials are not very beneficial during the hotter months of the year and can make being seated on such a texture, uncomfortable for any lengthy periods of time. Other materials also stain easily or can be worn quickly. Whilst not directly related to comfort levels, these last two factors will have an effect on your peace of mind. If you keep these considerations in mind, you will be able to find the best sofa for your family’s needs reasonably easily. The Bucktown Sofa is an example of seating that is both comfortable and aesthetically pleasing. Both of these factors are important when seeking items of furniture for your home interior. The rich and finely woven taupe tweed fabric will compliment a variety of styles in a living room environment. It especially lends itself to modern décor and will adapt well with carefully matched furnishings in a similar vein of form and function. 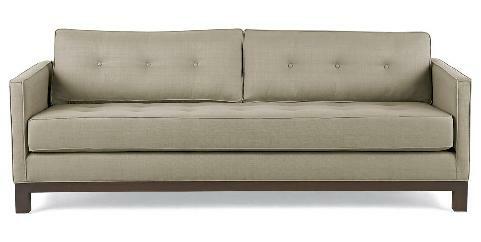 The contemporary Bucktown Sofa is generously proportioned and impeccably imbued with all-around tailoring. 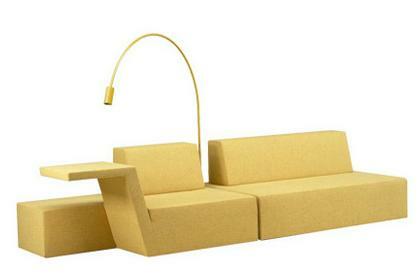 This furniture piece is as comfortable as it is classically angular. It also features a kiln-dried wood frame with espresso legs and inside, sinuous spring construction. 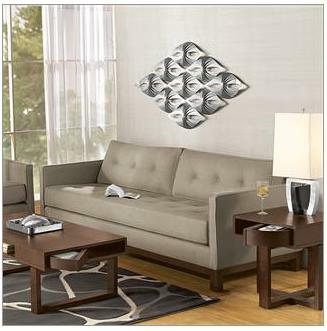 Angle it along a wall or alternatively, for a more modern look, position it in the center of a room whereby you can see the wonderful tailoring. The sofa can be put in the living room, a converted loft, a home study or even the main bedroom. As you can see from the pictures, it looks great on wooden flooring but does look as equally attractive on carpet. 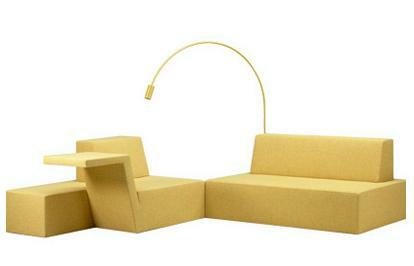 The Oasis couch is constructed of plywood covered with fabric. What’s interesting about it is the lack of decorative features so common to fabric-covered seating designs. The impetus is on the structural shapes of the furniture pieces and how they relate to their surroundings. Function merges with form and comes before decor. The couch consists of two separate and changeable seating elements. One section is composed of a laptop table built into the sofa seat which can also be used as a chaise longue. A lamp is attached to the more regular second section which arcs over the seating area to a position above the table. Underneath the seating is a comfortable level of foam. A number of interiors would be suitable for such a simple yet structurally interesting item of furniture. However, for cat and dog lovers who live in wet climates, its probably not a good idea. Belgian designer Bram Boo is the name behind the Oasis Couch.